What differences in portraits can students observe? What image of the individual do portraits convey to the students? What kinds of portraits have been made of historical figures? Review the lesson plan. The first three lessons comprise a unit in which students develop criteria for looking at portraits. In the culminating lesson, students use a portrait of a famous American and their own research to make a presentation to the class. The rubric provided at the end of this unit can be used to evaluate students' presentations, or as a model for designing your own rubric. The first three lessons should fit well into a biography unit or a study of a particular period of American history. Many examples of portraits are offered, but you can also use EDSITEment resources to locate additional portraits to fit your curriculum. For Lesson 1, ask volunteers to bring in some of their school pictures from the past. In preparation for Lesson 2, type the list of criteria the students developed. As the students make further refinements, update the list when practical. Lessons 4-6 are designed to stand alone. Use them after students have experience with portraits and then whenever it best suits your class. Lesson 4 helps your students write portraits in poetry. Lesson 5 can serve as an introduction to a careers unit. Lesson 6 encourages students to make self-portraits. Your students might enjoy this activity at the end of the year to create a simple yearbook. Download and duplicate as necessary any materials you will use. Choose from the images listed or use the resources listed at the end of this unit to search for your own. If possible, print at least one color copy of color images; if that is not possible, bookmark chosen portraits on an accessible computer for easy viewing. If desired, a model set of criteria for Reading a Photograph is available from the EDSITEment resource Harlem 1900-1940: An African-American Community. The "Education" section at the EDSITEment-reviewed National Portrait Gallery has a marvelous collection of teacher's packets full of ideas for examining several genres of visual representation. 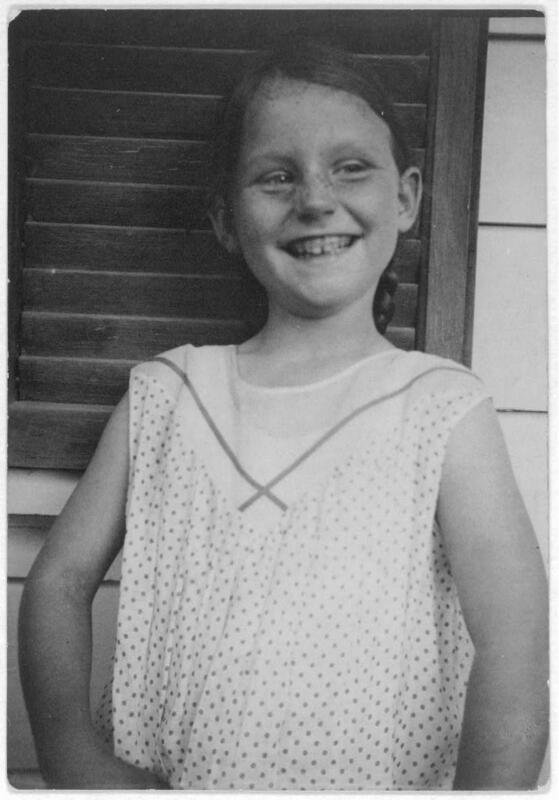 The EDSITEment-reviewed Digital Classroom offers a series of worksheets for analyzing primary source documents, including a photograph analysis worksheet, that you may wish to use or adapt to help students develop criteria for analyzing portraits. 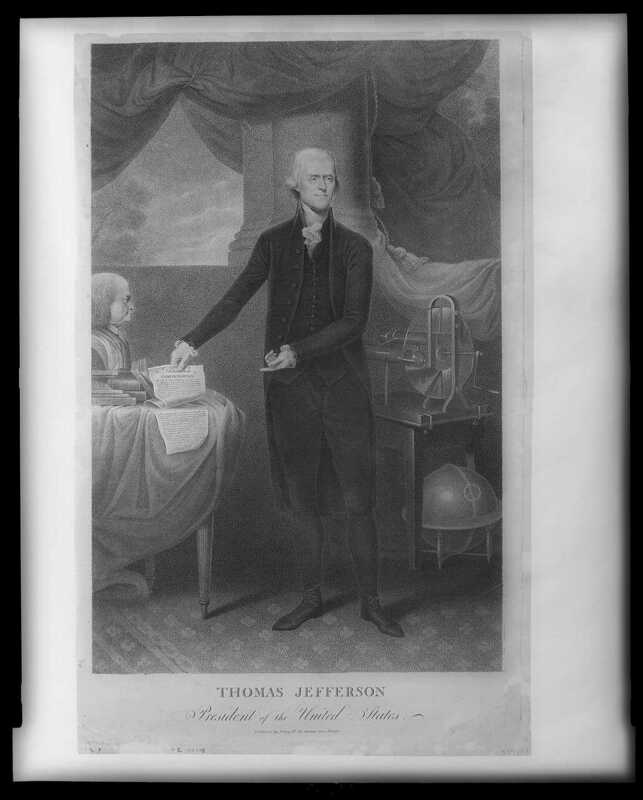 In this lesson, students will try to analyze what image of the children is being projected in some archival portraits. Portrait of a Boy With a Falcon, Wallerant Vaillant (Flemish, 1623-1677). 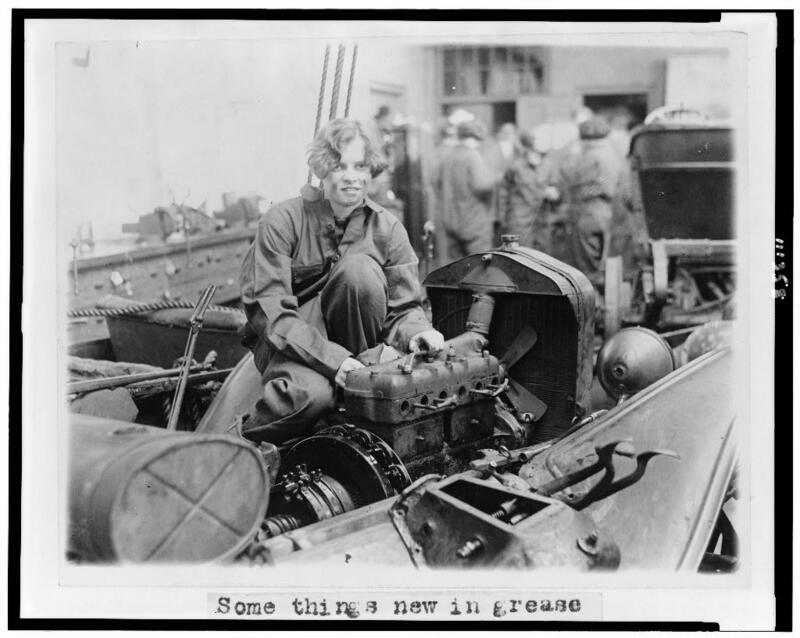 In addition to these portraits, show students a photo of Miss Grace Wagner, a student at Central High in Washington, DC, learning the art of auto mechanics (1927). Boy with issue of Saturday Evening Post; to find this image, search by title in the EDSITEment resource American Memory. Daniel Crommelin Verplanck, by John Singleton Copley, 1771. Available from the EDSITEment resource The Metropolitan Museum of Art's Explore and Learn. Students will use the criteria they developed in the previous discussion as a guide for assessing the portrait. Then, each student should write a caption regarding the characteristics of the subject in the assigned portrait. Next, students gather with others who looked at the same portrait to share their captions and compare and contrast their assessment of the subject. If desired, a presenter can be assigned from each group to share a composite of the group's reaction to the portrait. Why would an important person want a portrait of him or herself? Portraits can help project an image of high status for the subject. But, portraits can also deflate that status. This lesson focuses on the image a portrait conveys. Begin by passing out a list of the criteria the students designed for looking at a portrait. Review the criteria. The following list of possible images, organized in alphabetical order, represents portraits of famous Americans who were selected because students are unlikely to recognize them. Distribute an appropriate number of portraits. Working individually, in pairs or in small groups, students analyze one of the portraits below (or any the teacher finds) by applying their own criteria. Students are to hypothesize about the person (status, wealth, place in history and so on) and the portrait's purpose (meant to elevate the subject's status, to deflate the subject's status, unbiased, etc.). A studio portrait of Elizabeth Bonduel McCourt "Baby Doe" Tabor, wife of millionaire Horace Tabor; she wears a fur coat and hat, and is dusted with fake snow (available from American Memory). 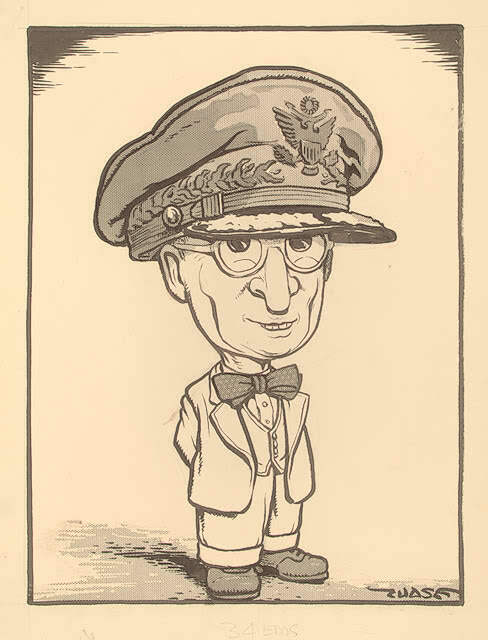 Caricature of President Truman by political cartoonist John Chase. A small image with information and a full-page image are available from American Memory. John Brown led a revolt in Harper's Ferry, Virginia, to end slavery by force; background information. John Calhoun, an eloquent U.S. senator with a reputation for having an explosive temper, believed strongly in the South's right to continue slavery; background information. 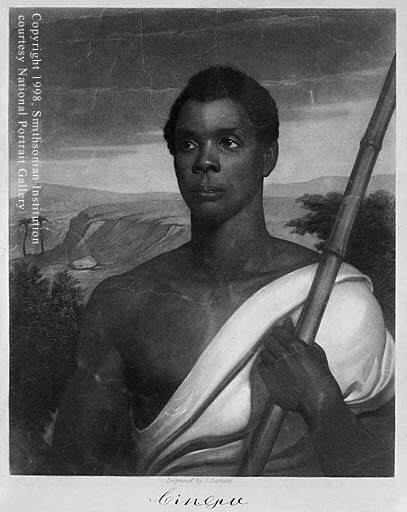 Joseph Cinque led the Amistad Slave Mutiny; background information. General George A. Custer became a national hero after his death, despite his military blunders, at least in part due to images like the one provided here (available from American Memory). Background information available from the EDSITEment-reviewed New Perspectives on the West. Jesse and Frank James wear suits and pose with revolvers in this studio portrait created between 1866 and 1876 (available from American Memory). After students offer their hypotheses, reveal the identities of the subjects, providing background information to help students evaluate their hypotheses. Throughout this unit, students have used their own pre-determined criteria to analyze various portraits and hypothesize information about the subject. Now, students will research a famous American for whom they also have a portrait. Have students use the class criteria to guide the discussion. Make sure students look carefully at the objects in the image: a copy of the Declaration of Independence, a bust of Benjamin Franklin, a globe and an electrostatic generator. What do these indicate about Jefferson's life and interests? Once you feel confident the students understand the analysis process, assign each student (or small groups) a portrait of a famous American and have students research the biography of their portrait subject. Students are to deliver a presentation or write a brief report tying the portrait to the subject's biography. The following list contains examples of the range of portraits of famous Americans available through EDSITEment resources. Use them to access additional portraits to fit such themes as biography, American Revolution, Presidents, First Ladies, Famous American Women, Civil War, Native Americans, Black History, The Twentieth Century, and many more. George Washington Carver with background information, both available from the EDSITEment resource National Portrait Gallery. 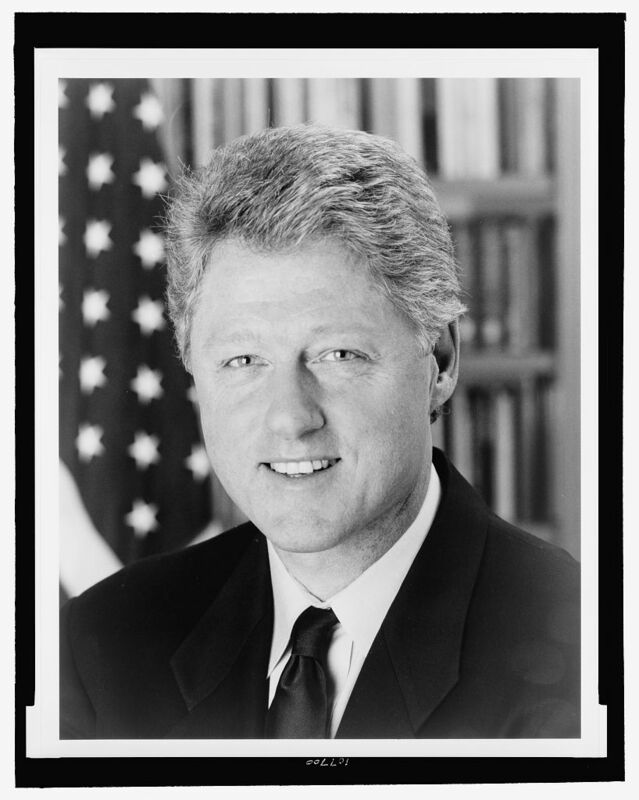 High-resolution head-and-shoulders portrait of President Bill Clinton from the EDSITEment resource American Memory. Candid photograph of Clinton, from the EDSITEment resource American President, reveals how the burdens of decision-making weigh heavily on President Clinton. Sculpture bust of President Clinton, from National Portrait Gallery can be viewed by scrolling down in the left navigational bar to "William J. Clinton" and clicking on the link. Albert Einstein, one of the most influential scientists of the 20th century, from National Portrait Gallery. Benjamin Franklin portrayed with symbols of his scientific achievements (oil on canvas, 1762, by Mason Chamberlin), available from National Portrait Gallery. Geronimo led Apache tribes in land wars with both the Mexican and U.S. armies; larger image (portraits available from National Portrait Gallery). Rosa Parks was arrested for civil disobedience when she refused to relinquish her seat on an Alabama bus to a white passenger in 1955; background information. Georgia O' Keeffe, a 20th-century American painter, available from the EDSITEment resource Metropolitan Museum of Art. Edgar Allen Poe, 19th-century American writer; background information. Sequoyah (1770?-1843) developed a Cherokee alphabet and encouraged the printing of books and a newspaper in Cherokee. General William Tecumsah Sherman, the Union general most known for his "March to the Sea." 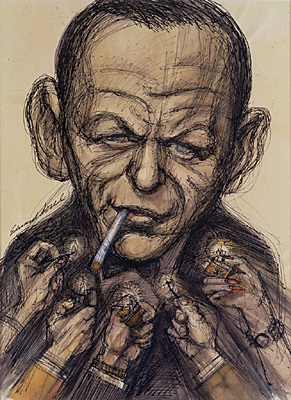 Frank Sinatra, 20th-century American entertainer; background information. Elizabeth Cady Stanton, a leader of the American suffragist movement; background information. Harriet Tubman, former slave and a leader of the American abolitionist movement; background information. George Washington, scientist and inventor: large image or smaller image with background information. Using a portrait poem appropriate to the class, attempt an analysis using the students' criteria for graphic portraits. In what ways do they apply? In what ways do they not apply? the subject's position"my grandma carries me"
the subject's expression"My muscles are enormous / they bulge from top to toe"
objects in the portrait"I like to carry elephants ... I pick up half a dozen / and hoist them in the air"
"Bloody Bill" presents a portrait of a character, Bloody Bill, created by the narrator. The pirate is described colorfully enough that students could draw his picture: "Bloody Bill / Was marching up the sidewalk / On the old Spadina Hill ... He had a sort of eye-patch ... He wore a bloody dagger / In his muddy, bloody belt." The poem also serves as a portrait of the narrator, who uses the story of Bloody Bill to avoid a fight. "As Soon as Fred Gets Out of Bed" also works as a portrait (albeit a bit silly looking portrait): "But near his ears, above his brains / is where Fred's underwear remains." A poem can also do, directly, what a portrait can only do indirectly?that is to take the reader into the mind of the subject. For example, "Last Night I Dreamed of Chickens" describes a child's dream. Students also could create poems to serve as captions for a gallery of portraits suited to a unit of study (a study of U.S. presidents, for example) that are available on various EDSITEment-reviewed websites. The couplet-a verse composed of two lines, usually rhyming-might be an appropriate form for students to use with this assignment. Students might also want to draw or paint portraits to accompany their poems. Why are so many portraits created of people with their work? Like the boy painted with his pet falcon in Lesson #1, objects in a photograph can help convey information. How do the objects in the following samples add to the images these photographs project? He Mined for Gold; background information. 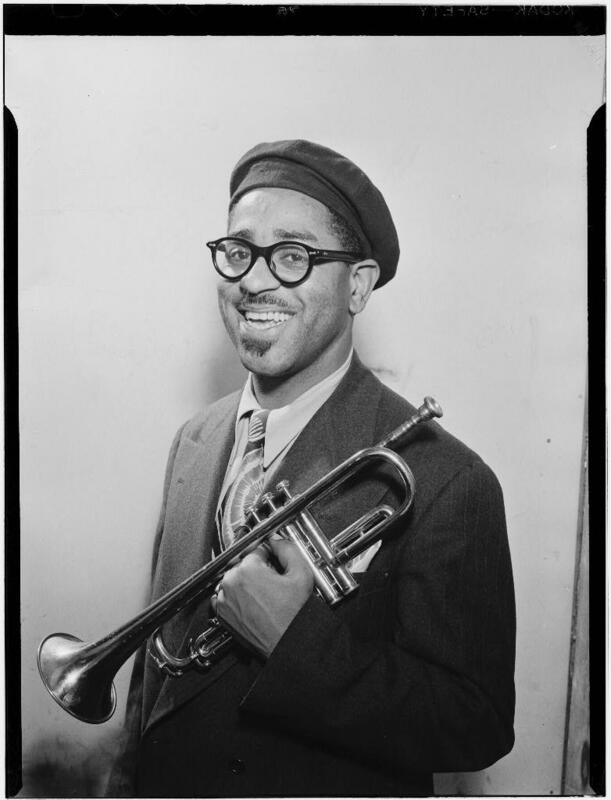 Portrait of Dizzy Gillespie, musician, available through the EDSITEment-reviewed American Memory; background information. 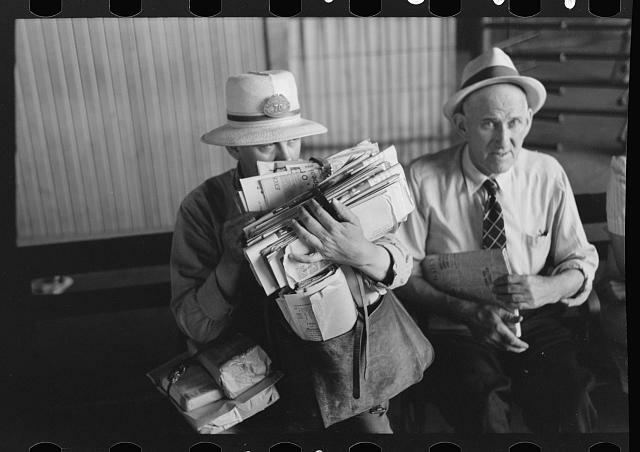 Postman loaded with mail waiting for streetcar (1939) Streetcar terminal, Oklahoma City, Oklahoma. To find this image, search for the title in the EDSITEment-reviewed American Memory. 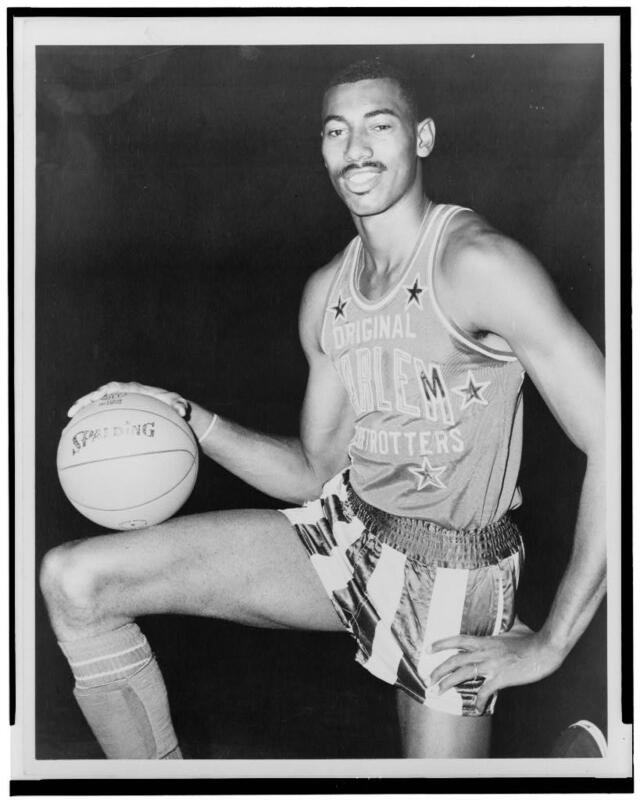 Wilt Chamberlain wears the uniform of the Harlem Globetrotters basketball team in this three-quarter length portrait found on American Memory. Students can create a gallery of portraits of subjects and their work to accompany a unit on careers or to report on jobs in a given place or historical era. 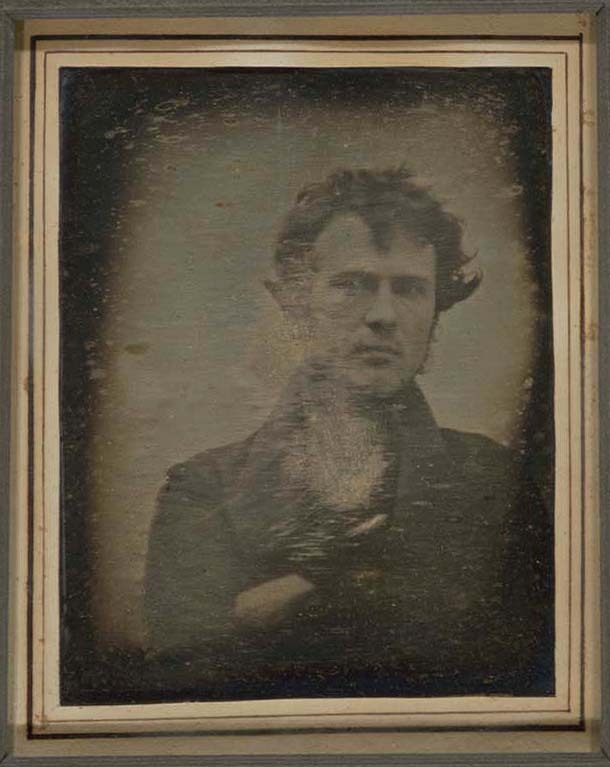 Robert Cornelius, The Earliest Known American Photograph (1839): small image with background information and larger image available from The Library of Congress, a link from American Memory. Now, each student can design a portrait to project a self-chosen image. Using a camera or digital camera would be a great way of creating the portraits. An exhibition (on a bulletin board or the computer) with appropriate captions can be mounted. You may wish to work collaboratively with your school's art instructor on this project. If appropriate technology is available, assign small groups of students to find and download portraits related to relevant historical events, and to label them with bibliographic information and historical analysis. For example, portraits could be used to create a picture book about important personalities involved with an historical event being studied in class. Have students conduct research on the history of photography, including the daguerreotype process, and how changes in the technology over time affected the potential content of photographs. Encourage students to use portraits to trace social and cultural changes through time, such as in military uniforms or high-society fashions. 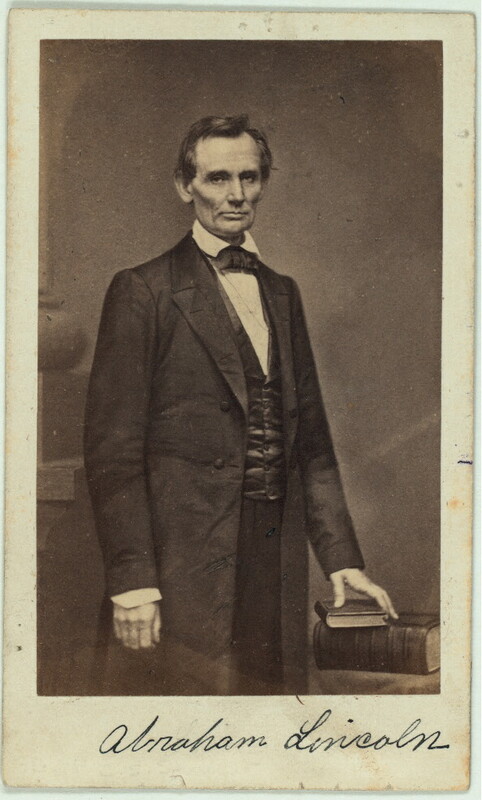 Lincoln without a beard (c. 1860), available through the EDSITEment resource American Memory. The first photo of Lincoln with a beard (1860), available from the EDSITEment resource American Memory. President Lincoln the last week of his life (1865), available through American Memory. Butterfield, Moira and Susan Peach. Photography. London: Usborne Publishing, 1991. Freedman, Russell. Lincoln: A Photobiography. New York: Clarion, 1987. Lowe, Jacques. Looking at Photographs: People. San Francisco: Chronicle Books, 1996. Meredith, Roy. Mr. Lincoln's Camera Man: Mathew B. Brady. New York: Dover, 1974. Turner, Robyn. Dorothea Lange. Boston: Little, Brown & Company, 1994. King, Penny and Roundhill, Clare. Portraits (Artist's Workshop). New York: Crabtree Publishers, 1996. New Perspectives on the West -- People in the West and Archives of the West contain portraits of and background information on many important historical figures and ordinary folk.